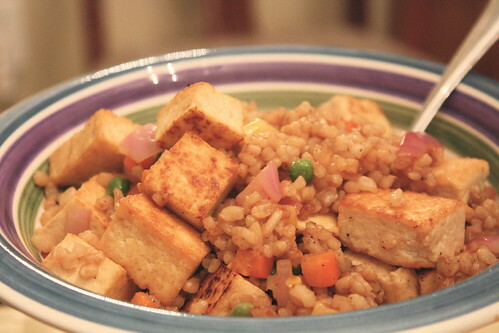 I saw Tofu vegetable fried rice today through foodgawker and it inspired dinner! I drained the tofu, wrapped it in one paper towel, then wrapped that with a kitchen towel. 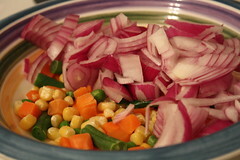 I then put a heavy cast iron pan on it and let that sit while I chopped up the onion and thawed the vegetables. 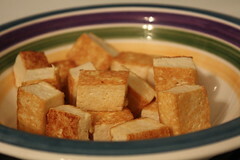 I sliced the tofu lengthwise then cubed it so that they were small-ish cubes. Heat some vegetable oil in a skillet over medium. When it’s hot, add the tofu cubes. I flipped them around to get as much of the sides browned as possible. Cook for about 5 minutes. Remove and save. 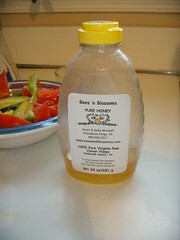 Add some vegetable oil to the skillet. Once it’s hot, add the onion and vegetables. Stir-fry for about 5 minutes. Add rice. I cooked for about 5 minutes. If the rice is too cold, I would heat it up so that the vegetables don’t get overcooked. Add soy sauce, pepper, then the tofu. I add enough pepper so that I see it. That’s how I know it’s the flavor I like. That’s up to preference, much like the soy sauce. Heat for about 2 minutes. In the past, I’ve added egg to fried rice. To do that, I push the rice to the side and add a little wetness like butter to a corner of the pan. The egg fries up quickly, then gets folded into the rice. Also, I’ve done cornstarch on the tofu before but wanted to try without this time. I didn’t miss it. Clockwise, starting top-left: Fat-free yogurt with cherries and grapes. I cut the fresh cherries in half to get the pit out. Then though that that looked keen so added some halved grapes. Pretty tasty. The cherries fresh are a little tart, so is the yogurt, but the grapes helped calm everyone down. We then have more grapes– can you tell I love grapes? And under those grapes are some leftover apple bits. And the next container has — surprise — more grapes and some apple slices. I put the skin side up and didn’t add anything to it to see how badly it’d turn brown. Didn’t do badly at all! That’s an organic Fuji apple. Num! Last, but not least, we have left-over brown fried rice with a sprinkle of parsley on top cause I was feeling cheeky. I did microwave the rice for about one minute but it was fine cold. Tasted better at least at room temperature, though. This is a WW Core meal. 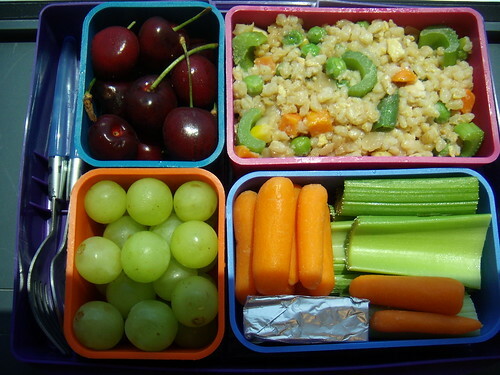 Leftover homemade chicken fried rice (brown rice), cherries, grapes, carrots, celery and Laughing Cow light wedge. Tried to be mostly WW Core but the cheese isn’t. Didn’t finish the carrots. Not a fan. In case you’re curious how I transport my laptop lunch, here it is. Some use the insulated bag that they sell, and some just use any sort of bag. 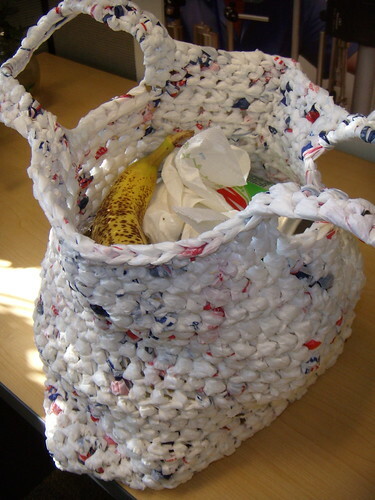 I use this crocheted recycled plastic bag bag that I got in a “worst present” exchange. I got the better deal out of all the people. The bottom expands to hold the box in a horizontal state and keeps it snug so it doesn’t move. Seriously? I know it’s gone up but 40% in a year? Rice. The article goes on to talk about the staples being snatched up like bread when the news talks about snow around here. (For those not around here, snow is maybe max of an inch. We are not New York. We just panic a wee bit.) Alright, fine, I’ll go with an increase in food prices. I’ve seen it though didn’t document it. I’ve only been doing that price sheet for a little while now. But if people buy lots of rice and flour and oil, what’s that do? Rice and flour goes bad after a while. I’m surprised there’s not a huge shortage of canned goods. That, I thought, lasts longer than rice. Maybe if the rice were sealed in smaller containers? It would make storage easier. Just. Odd. But if there is a shortage coming on flour, rice and oil, then I should be fine here. I don’t cook rice that often. Flour is the Devil. And the oil I most prefer is olive oil. If I didn’t have that, then I would be a sad panda but I know oil will go rancid. I’m only cooking for one or two. I won’t use it quickly enough to do a run on Costco. I do not like the idea of those in poverty being even worse off. If staples are going to be too expensive to buy then what about silly things like vitamins or vegetables? Sigh. This does poke the part of my brain that’s been churning the “I need to try a garden again” idea. I even saw in a recent article by the local paper about container fruit trees. My backyard isn’t ready for permanent trees yet. It still needs a new storage building and fencing.